We have documented approximately 30 lazy deuces like this that are known to exist. 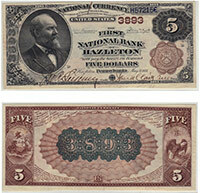 This is a very popular bank note from a very popular area of national bank note collecting. Values can get very high; they are just based on the condition and serial number. Contact us for exact price information. Don't forget to check the serial number. Number 1 notes always sell for nice premiums.